After nearly three years living at the end of the road one of the things that we try not take for granted is the silence. Yes, we will always have the birds and their season songs but, with the exception of bleating lambs and the occasional rumble of farm machinery, it’s quite easy to while away the day listening to the pin point of nothing. Time disappears into silence. Without the passing of modern life we frequently prove to ourselves the hopelessness of body clocks and sun charts. During days off the run of life quickly returns to the elements of sleep, hunger and, of course, children. We have also come to ridicule the weather forecast. Our place on the Pennines is just eight miles south west of Huddersfield yet any similarity with the weather conditions of this grand town stops with the shape of the clouds. As children we would make expeditions to ‘town’ wrapped as though we were Arctic explorers only to be met by strangers wearing jumpers and trainers. Return journeys would be spent re-dressing in the condensed air of the 352 bus in readiness to be evacuated at the West Slaithwaite turning circle where the road would turn white. Today, the seven am text message that shattered the silence proved that the weatherman had, for once, got it right. School is closed read the first from juniors. Then came the infants and finally the high school; heavy snow had been forecast and heavy snow had landed. The children retreated back to their rooms as we laid in the warmth just looking at the milk white view. Nothing moved; the world was silent again. 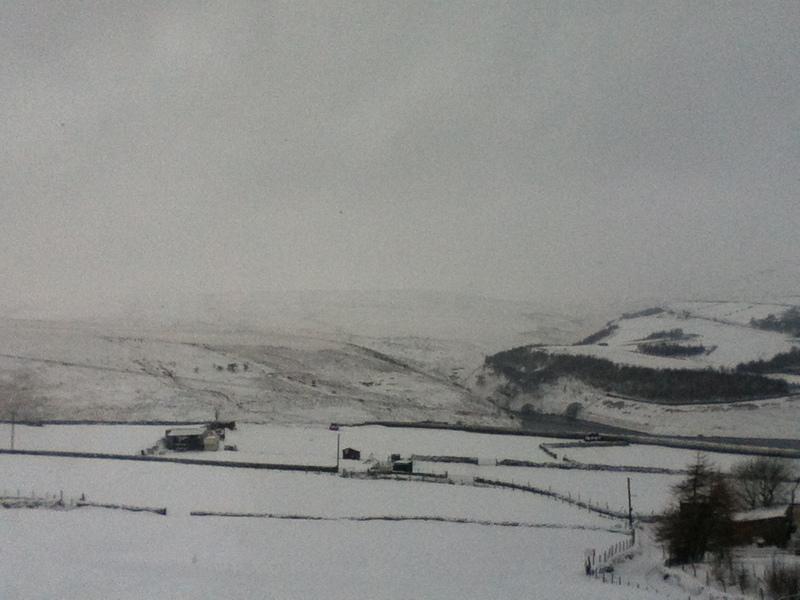 The snow reminds me of our days at Rotcher in nearby Slaithwaite where the neighbouring Trans Pennine railway challenged the rural idyll. I used to watch the passing trains and catch glimpses of the passengers; all the passing people journeying, going somewhere. The sound of passing trains became almost comforting: sounds of people; of life still turning. When the trains stopped during heavy snow the silence became almost deafening, almost awkward in the rooms but, strangely, as the snow thawed we would mourn the loss of the silence. Today is a snow day and that means cancel all plans and enjoy. Today also sees the publication of a new poem on the poetry and prose webzine, Ink, Sweat and Tears. Threadbare has been described as a poem that will haunt you and, whilst it is a challenging piece of work, there are some universal themes to explore. You can find out more at http://www.inksweatandtears.co.uk. The snow day has secretly put on hold good intentions to sit down with the recently arrived art book, Gloaming by artist and musician, Keaton Henson. If you’ve not already come across Keaton then I would urge you to explore his website at http://www.keatonhenson.com. Keaton’s 2012 album Dear was almost the one that got away but thankfully social media knocked on the door and the track, You Don’t Know How Lucky You Are is quickly heading towards the most played list. Another book recently arrived that will have to wait is Paul Muldoon’s new collection, Songs and Sonnets. This is a fascinating collection challenging the concept of song lyric as poetry. For more information see http://www.enitharmon.co.uk. Now back to writing and painting avoidance techniques part one. Just for fun and exploration, here’s a snow inspired playlist to enjoy. I had considered Snowballed by AC/DC as an extra track but the silence was waiting. So there really are some excellent artists who have songs named after the elements? !